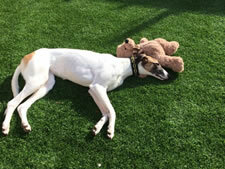 Artificial Grass, artificial lawn, fake grass, astroturf, faux grass, false lawn… What ever you call it, we install one of the best Artificial grass products you can buy from Trulawn. 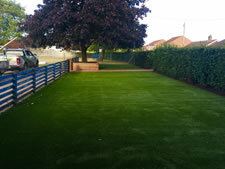 With a natural feel and look and almost maintenance free, call Jamie Gooch for all your Norfolk Artificial Grass and Artificial Lawns. 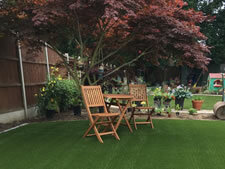 We offer a wide range of quality artificial grasses by specialist grass manufacturer Trulawn. 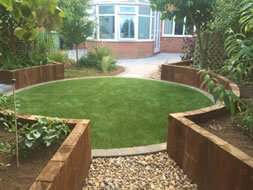 Jamie Gooch Ltd, an award winning landscaping contractor, offers you the best quality landscaping services & products – Call us for your free competitive quote or just some friendly honest advice. We can also offer a supply only service and have the grass and fitting materials delivered direct to your home or premises. We can offer free samples of grass – Just contact us. Jamie Gooch is part of Check-a-Trade > Read over 250 positive customer reviews of our work!